I would like to remind you of some of the resources on our site. Project Registry. This is where builders list their Glen-L project along with their email address - but there is more here. By reading the updates on boats you are interested in, and other similar boats, you can get an idea of building time. Customer Photos. Attached to most of the photos are emails or letters from the builders. Frequently these messages will contain information that can help you decide on a project. Useful Information & Suppliers. These pages include: Lumber Suppliers List, Jet Suppliers, Diesel Engine Manufacturers, Misc Suppliers (aluminum spars, fiberglass core materials, airboat props), Glossary of Terms, Tables of metric and other conversions, Links (including Glen-L builder sites). For your questions about epoxy, see the EPOXY pages. Wood and Plywood Information. These pages include a chapter from Boatbuilding with Plywood on boatbuilding lumber and technical specs from the American Plywood Association. What else has been added to the site? ....as always lots of Customer Photos and Project Registries and updates. The webMASTER notes on the site have not been kept up, so it is hard to remember all the changes and additions. There have been new listings in the Lumber Suppliers list and Links pages and additions to Boatbuilding Supplies. The Outboards section of our online Boat Design Catalog will be the next one for a face lift; should be on the site before the next WebLetter. New pages will include a bill of materials for the hull. Our Year 2000 edition of our hard copy "Book of Boat Designs" catalog is almost here. The negatives are being shot as I write this and when complete should mean we have the catalogs two weeks later. The new catalog will be a vertical format (formally it was a horizontal "album fold"). It will have 40 additional pages with many more photographs. You can order the new catalog through our secure order form or by one of the other methods listed on our How to Order page. On the drawing board... Our current project is a pedal boat. This is something we have been receiving requests for for years. Glen and Allyn have been sharing ideas on the mechanical parts and Allyn is starting on the hulls. See more in this WebLetter. Would you like to become Internet famous? We are looking for articles, boat building hints, and photos for future WebLetters. The point of this WebLetter is to be a resource for boat builders... why not put in your two cents worth? How about "Shop Talk" about a particular procedure, special jigs you have made, or the right tool to use? We look forward to your input. We'd like to offer a free issue of SCA to any of your readers who mention they saw the special offer on Glen-L's website. In addition, we'd like to add that the offer is only available to the first 500 respondents. Please remind them that they must mention Glen-L to receive the free issue. Our website is looking a little better so feel free to send interested parties that way. For more information on Small Craft Advisor, see WebLetter 17. To request your free magazine, email: smallcraftadvisor@thegrid.net and be sure to mention you are responding to the offer on the Glen-L site. For years we've had requests for human powered "pedal" boats, and for years we've had to say that we didn't have them. Well that will soon be remedied. The "Pedal-It" will incorporate readily available bicycle parts. It will be a pontoon hull with a rudder fabricated from pipe and fiberglass. We will have more on this project in our next WebLetter. There is no due date as yet. After the test model is completed, the drawings will be finalized, instructions written, and drawings and instructions proof read. Click here for photos of the beginning stages of construction of the test model. We have been getting a number of email questions concerning "add-ons" for existing boats. Things like "center console", "sliding rowing seat", and "flying bridge". We don't have flying bridge plans, but their construction is covered in our book "Boatbuilding with Plywood". 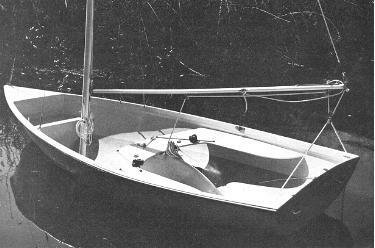 Several builders have adapted the Console Skiff Console Patterns ($17.00) to their boats, and the Sliding Seat plans ($23.00) for the Sculling Skiff are available separately and have been popular with many builders for use in their rowing boats. The copy below is from our "Book of Boat Designs"
The Hardware Kit includes all of the hardware pieces described in the plans and patterns package that are required to build your own SLIDING SEAT assembly. Complete with: stainless steel bolts, nuts, washers, screws and threaded rod, plus track, sheaves, heel cups, instep leathers, and sculling oarlocks. Why run all over town looking for the right pieces? Let Glen-L do it for you. UPS shippable, weight approx. 5 lbs. Shipped F.O.B. #05-206 Sliding Seat Hardware Kit: $121.46. The New Glen-L Book of Boat Designs will be available within the month. In response to inquiries about an out-of-print book published by Glen-L, we are starting a series in our WebLetters, reproducing Rigging Small Sailboats. This issue contains Chapter 5; to be continued in the next WebLetter. FIG. 5-1-This neatly rigged boat is ready to receive the sails. The running rigging is clearly shown. This mainsheet rig is like that shown by Fig. 5-4. The clew outhaul slides on a track with a line securing it to a jam cleat on the side of the boom. The aluminum tubing boom is held in position by the main halyard. The main and jib halyards are neatly coiled in position on the mast. Note the tracks with sliding cam cleats on each side of the centerboard for controlling the jib sheets. The RUNNING RIGGING consists of the lines used for hoisting and controlling the sails directly, or indirectly such as through control of the boom. The boat in Fig. 5-1 shows many of the lines used for the running rigging in position. The running rigging moves about the boat, or can be moved. The LINES are usually made from ROPE. Once the rope becomes operational in the boat, it is then referred to as a "line". This then is the difference between line and rope. Most lines on small sailboats are made from synthetic twisted or braided rope, such as polyester or polypropylene. Nylon is usually not a good line because it stretches too much. Ropes of natural materials such as hemp are seldom used anymore. Wire rope is sometimes used for some running rigging, but must be connected to rope at the moving ends that must be handled. A type of rope made especially to be easy on the hands is called "YACHT BRAID" or other similar proprietary name, and is more costly than the normal braided line. Rope sizes are commonly noted by the approximate diameter of the rope, even though it was once common to give the size by the circumference. The lines used for hoisting and lowering the sails are called HALYARDS. The halyards run up and down the mast across a sheave (pronounced "shiv") at or near the top of the mast. Halyards that are outside the mast are called "external" halyards, and those that run inside a hollow mast are called "internal" halyards. Halyards on small boats can be made of rope, and often stainless steel wire rope is also used. When wire rope is used, it should be the flexible type such as 7 x 19. In the case of wire rope halyards, a portion of braided or twisted rope must be attached to the running end so the crew can handle the halyard without injuring their hands. The braided rope is then attached to the wire rope either with a Nicopress eye, or by a special splicing. On large boats, special halyard winches designed for wire rope preclude the need for a rope tailing. Several methods are used to attach the halyards to the head cringle of the sails. Probably the most common method is the use of a SHACKLE, a "U"-shaped fitting with an openable pin at the open portion of the "U" which passes through the head cringle (see Fig. 6-2). The halyard is attached to the shackle either with a spliced eye, Nicopress eye, or it is sometimes merely tied by a knot. A better method when wire rope is used is to use a ball joint with the shackle fitted onto the wire rope halyard before the ball has been swaged on (see Fig. 4-2 'a'). When wire rope halyards are used with a ball joint, a HALYARD HOOK should be used near the masthead. This fitting prevents hoisting the sail beyond a predetermined point up the mast. Sometimes an additional halyard hook is located near the mast base for the running end of the wire rope halyard with another ball swaged at this end to secure the halyard. A couple of years ago we contacted you looking for plans to build a tournament style ski boat. The closest hull you had to offer us was the Renegade. We liked the hull shape but thought the boat in general had a dated look. We purhased the plans from you and it took a whole year to finish the boat. I am sending you a couple of pix to show what we did to the plan. We followed the plans exactly to build the hull to the deck line and then put our own idea of what we thought a more modern deck should look like. 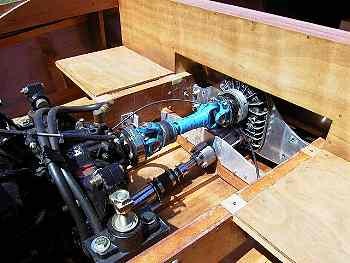 We used a straight inboard installation using a 350 Chev engine 265HP, and a Borg velvetdrive hydralic transmission. We built the boat strickly for the purpose of watersking so the seating might not appeal to everyone. I am sending you a couple of photos of the boat, if you wish more we have a complete set of pix as we built it following most steps. If anyone is interested in this type of boat we would be glad to send them photo's and give them any assistance that we can. You can give my e-mail address to anyone interested. My Thunderbolt was completed with application of the topside paint on April 28 2000. The top and bottom is painted with Interlux Brightside, the bottom being teal and the bottom white in color. I had my doubts about how a garage applied roll-on paint job would turn out, but this Interlux stuff is amazing. It goes on with a rough appearance with many small bubbles, but flows out to a smooth finish as if it were sprayed on. The only trick is to make sure any accessibly large bubbles are rolled out before the paint dries. I highly recommend this paint, very economical considering two quarts is plenty for the entire craft. Power is derived from a stock Mercruiser 260HP V8 with Velvet drive transmission running through a Casale V-Drive. The engine was acquired on Ebay, a factory new unit never installed in a boat. This cost me several grand, but after adding up the expense of everything required to do an automotive conversion, it seemed quite reasonable. The heavy and bulky Mercruiser cast iron exhaust manifolds were replaced with Glenwood logs. These were installed upside down in order to clear the rear decking. I stayed with the stock Mercruiser cooling system, which has two outlets for each manifold, one for hot water which flows through the thermostat and the other for bypass water. Originally the hot water dumped into the manifold and bypass water into the elbow (I assume this is to keep the manifold at engine temperature). I reversed the connection on the Glenwoods to keep the manifolds cool. Hope to be able use use the manifolds as a handle for water skiers boarding the boat. The original 1" water hose was replaced with 1/2" to accommodate the fittings on the Glenwoods, still there seems to be more than enough cooling capacity. The V-Drive is a In/Out Casale unit coupled to the Velvet Drive through a short drive shaft. The In/Out unit is left locked in gear, as neutral and reverse are obtained with the Velvet Drive marine transmission. The engine instruments are new "old stock" acquired on Ebay. The controls are a used model from an older Mercury outboard, also aquired on Ebay. This keeps with the vintage theme of this style of boat. I intend to add a depth gauge, as I already struck a rock with the prop and had to replace both the prop and shaft. First run was on April 29, 2000. Because the engine is new and I did not want to take any chances, the speed was kept down to around 35 mph. Very suprised at the steering balance and response. I've always been told that inboards do not handle as well as outboards or I/O's, but I love the response of the Thunderbolt. Steering is light and responsive, unlike the I/O's I have owned which feedback considerable steering torque at speed. The overall balance seemed excellent, without much tendency for the bow to raise during hard acceleration. Should make an excellent ski boat. I wish to thank Barry and all the folks at Glen-L for their timely help during the construction process. 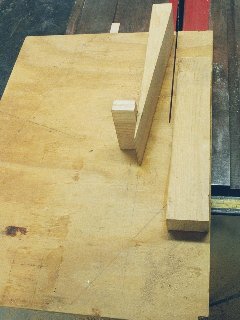 I wanted a quick and highly repeatable way to cut scarf joints for the chine, sheer and battens. The methods listed in the books (hand saw, router jig, hand plane, etc) did not appeal to me. I wanted to do the cuts on the table saw. 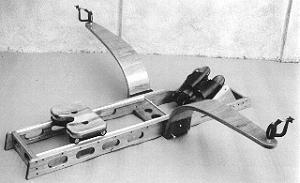 This sled is modeled after a cross cut sled, but with a pair of fences added for positioning the stock. All of the wood is from the scrap bin. The angled fence and the wedge are from a 2x4 which had its edge jointed to square it up. The 2x4 was cut for an 8:1 slope as recommended in the plans. The wedge fence was glued and clamped while checking that it was absolutely square in the vertical direction. The wedge fence is shown with a bracing block which holds the thin end of the wedge fence vertical. The other fence to the right is used for clamping. Remember to save the off-cut from the wedge fence for use as the clamping wedge. The pencil marks are from a previous use of the plywood scrap and serve no purpose here. This is the bottom of the sled. It shows the plywood base and maple runner. 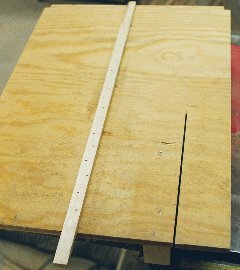 The runner is sized to fit the slot of the tablesaw miter slot closely. The runner is glued and nailed (for clamping). To align the runner, place it in the slot of the table saw with wet glue surface up. Position the rip fence appropriately, and then place the sled bottom over the runner and against the rip fence. Next fasten the sled to the runner with brads from the top. This will hold it squarely in position. Add more brads from the bottom to hold it securely while the glue hardens. Gayle Brantuk from Glen-L forwarded me your question concerning the costs of building the Glen-L 30. However, it is very difficult to answer satisfactorily because I made my boat from fiberglass and I started some 25 years ago. It was last February when one Italian asked me my experiences about my boat. Because my answer to him is not too personal I think that I can forward it to you as well. If you are interested in hearing more about my experieces building the boat like Glen-L 30 and my boat itself please don't hesitate to ask. I am very pleased to notice that you are interested in my experiences concerning Glen L 30. 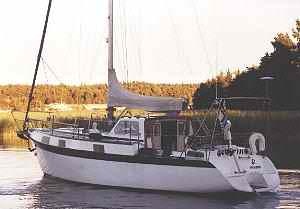 As a matter of fact I started to build my boat in 1976 when I was young, eager and short of money. However, I am happy that I started then even though it has taken all my spare time (and money) ever since. I am satisfied also that I build a boat big enough at once because boatmen are always dreaming about bigger and bigger boats. Glen L 30 is however very spacious so that even 4 to 5 adults can live aboard for weeks. On the other hand, on my boat I have full batten main, furling head, autopilot, bowthruster and rather powerfull engine so that I can handle it very easily only by myself alone. (Now you understand why it has taken all my money). Because all this equipment I have collected during last 20 years, the weight of the boat is nearer 7 tons than 6. It makes that in very light winds it is rather slow but when it starts to blow 6 -10 m/s, six knots is easy and stability is good, you can sail for hours without touching rudder. Heeling is modest 7-12 degrees, mostly less than that. If you take one reef to main and furl somewhat headsail you can easily sail in winds from 12-15 m/s. Construction time and costs are very difficult to estimate because I have made some modifications and improvments all the years I have had the boat. Not because the boat itself was bad but because I have seen good solutions in other boats and originally I made it with very little money. The plans were very good and if you follow them and don't do any modifications building Glen is easy. If you make compromises for instance in finishing you can build the boat rather quickly and if you have money enough to buy rig and all kinds of fittings and equipments factory made you save a lot of time. The place where you build your boat should be large enough and sheltered so that you don't need to worry about your working tools and so on. If you afford to invest for good tools at once it will save you alot of time and it is pleasure to work. I made my boat from fiberglass but plywood is very good too with epoxies and other good glues and paints. Plywood may be even easier and faster to build. I suppose that costs are higher here in Finland than in Italy especially concerning boating gears. I think that with 15,000 ECU you can have a boat which sails, 30,000 ECU you can have a boat with good basic equipment and live aboard convenience, and with 50,000 ECU a boat of superb finish, fine fittings and full inventory of devices (that kind of a boat in Finland costs 120 000 ECU). But it takes some thousands of hours to work (perhaps 3000) and from two to four years depending on your abilities concerning money and help from your friends and especially from your wife. If you are interested in hearing more, please mail and ask. Unfortunately I have not many pictures about my boat but I can take them and also otherwise consult when needed. ANSWER: The Trailer Plans are for boats within a certain size and weight limit. The supports for the boat are not detailed. 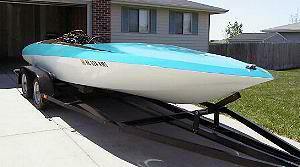 This information is contained in the book How to build Boat Trailers which comes with the plans. It is likely that one of our trailer plans could be used, but there are no specific details. Below is a special feature... Stroke the webMASTER. These comments have been collected the last few weeks. I could have posted a lot more, but I don't want to brag. Comments: This is great! I am also building the hunky dory.Have been getting your catalogs for years, your web site is great. Comments: Wonderful site Keep it up. Comments: You have very good designs, and reasonable prices. I wish one day to build one of your designs (probably a Glen-L 17 or 21). Very well orgainized web-site - one of the best I have ever seen! It's a real pleasure to brouse! Comments: I used to dream of building one of your boats when I was a teenager, during the sixties. I was thinking about it while mowing the lawn last weekend. Wondered if you were still in business, came and entered "Glen L" in the internet search engine to see what would turn up. Comments: Great Site Guys!!! I plan to order plans\Kit soon. Comments: I like your website as it is a wealth of information on boat building. I am planning to order one of your boat plans soon.